Did you know the best recipes just happen out of nowhere? 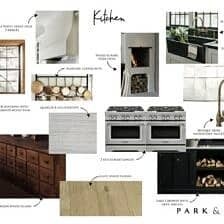 Because I have discovered time and time again that some of my favorite recipes are the recipes that I just start throwing things together and calling it a meal. This meal – snack, dessert, breakfast or whatever you want to call it, happened at the end of a not so awesome day creativity wise. It was almost like my brain was so fed up and annoyed with not producing one creative thing all day long that just staring blankly into my pantry triggered an idea. Well, that and I was in need of a snack. Also, I have kind of been in a summery foods mood lately, and ice cream cones just seemed fun. Double also, the photo above would be a million and one times cooler if my nails were painted a pretty shade of turquoise blue or a springy purple. Unfortunately, I am just not that cool. Wishing I was at this moment though. Alright, so there I was standing in my pantry looking around hopelessly trying to think of something when the waffle cones on the top self caught my eye. All it took was seeing those cones and I knew exactly what I was making for a snack. It was gonna be epic and super quick since I already had the popcorn made from a previous little project. 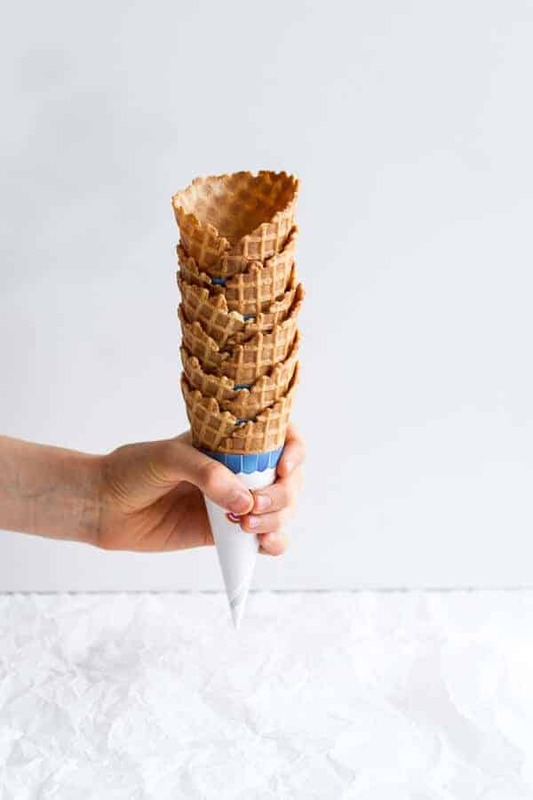 If you are thinking it is too cold for this cone well then, one it is a good thing this is not ice cream and, two that’s a little crazy. Really though, the yogurt makes for the perfect complement to the warm Nutella and bananas. Add the popcorn and it is similar to granola and yogurt – but better. 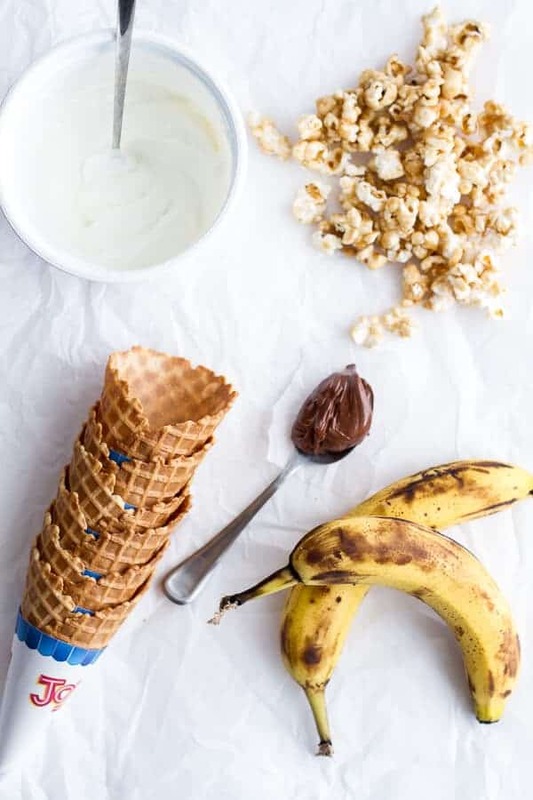 We’ll just pretend that the popcorn is sugarless… and super healthy. K? And hey, popcorn is actually a whole grain, so we are totally good to go. Oh, and since there is yogurt and “WAFFLE” cones these qualify as breakfast food too, right? If you are thinking it is too cold for this cone well then, one it is a good thing this is not ice cream and, two that's a little crazy. Preheat oven to 250 degrees. Grease a baking sheet with cooking spray or line with a silpat. Add the popcorn and cashews to a large bowl. In a medium sauce pot, combine the brown sugar, molasses, butter and salt. Bring the mixture to a low boil, stirring constantly with a whisk to melt sugar and fully combine all ingredients. Continue to whisk mixture for 3-4 minutes. Remove the caramel from the heat and slowly stir in the vanilla. Working quickly, pour the caramel mixture over the popcorn and cashews. Toss well to coat. 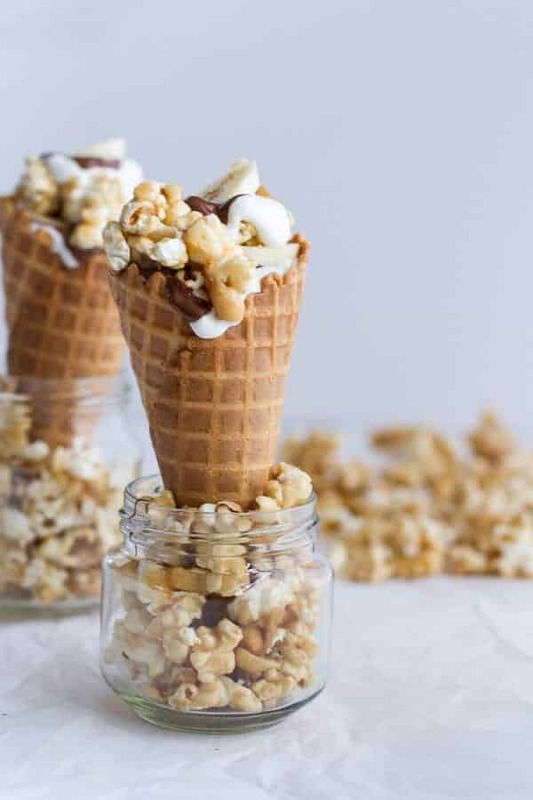 Bake in the preheated oven for 30 to 60 minutes, stirring every 10-15 minutes and scooping any caramel from the bottom of the pan back onto the popcorn to coat the popcorn thoroughly. The longer you cook the popcorn the drier it will be. Once the popcorn has cooked at least 30 minutes turn it out in a single layer onto parchment or wax paper and allow to cool fully. To assemble the cones, mix the greek yogurt with the vanilla in a small bowl. Add the Nutella to another small bowl and warm it in the microwave for 30-60 seconds or until it is easily spreadable. Place the cones in a drinking glass so they can stand. 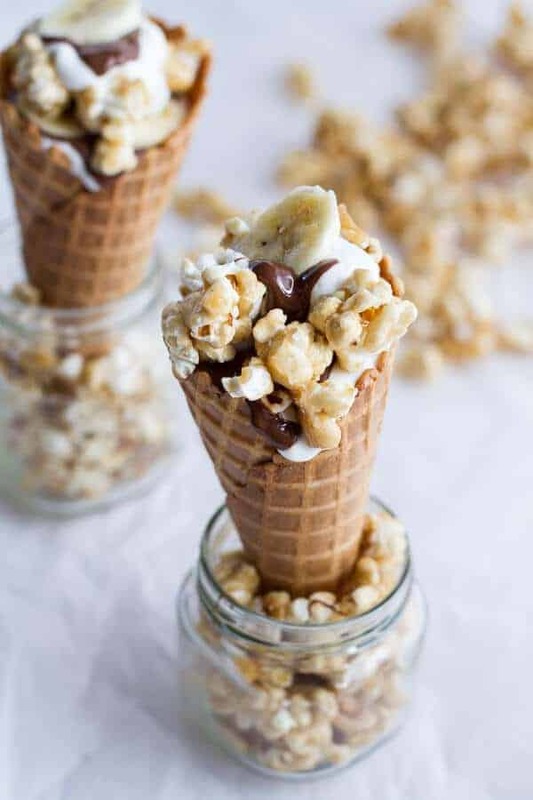 Layer each cone with greek yogurt, a drizzle of warmed Nutella, banana slices and then popcorn. Repeat the layers three times or until you have reached the top of your cones. 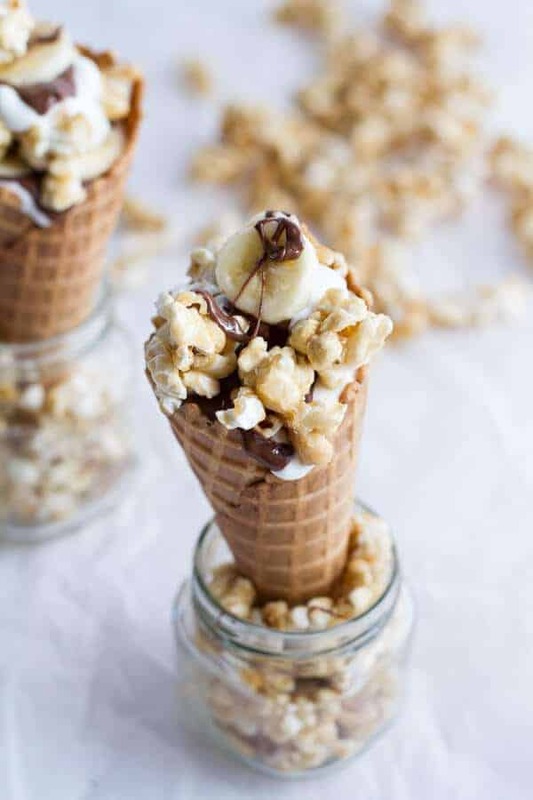 Drizzle with a little more Nutella and add a handful more of popcorn. EAT! Healthy(ish) food in a waffle cone? Yup, just as good as it sounds. HEY GUYS, I NEED YOUR HELP!! 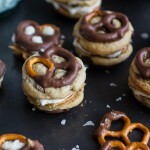 Peanut Butter Stuffed Chocolate Covered Pretzel Cookies ‘N’ Cream. 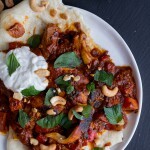 Saucy Indian Spiced Chicken with Naan. It took me a while to digest the title of this post, and it blew my mind. That is all. 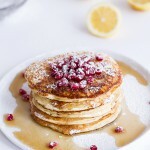 This is my kind of breakfast food! And I need to have that cashew popcorn on hand now. I want this for breakfast and snack and lunch and dinner. I mean fruit, whole grains, protein and chocolate! That constitutes a complete meal in my mind! 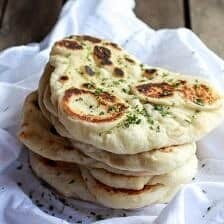 Love how simple but super creative these are Tieghan! Thank you so much, Taylor!! I will be making that popcorn very very soon, this looks great! Thanks Kathy! Hope you love it! Such a cool idea! 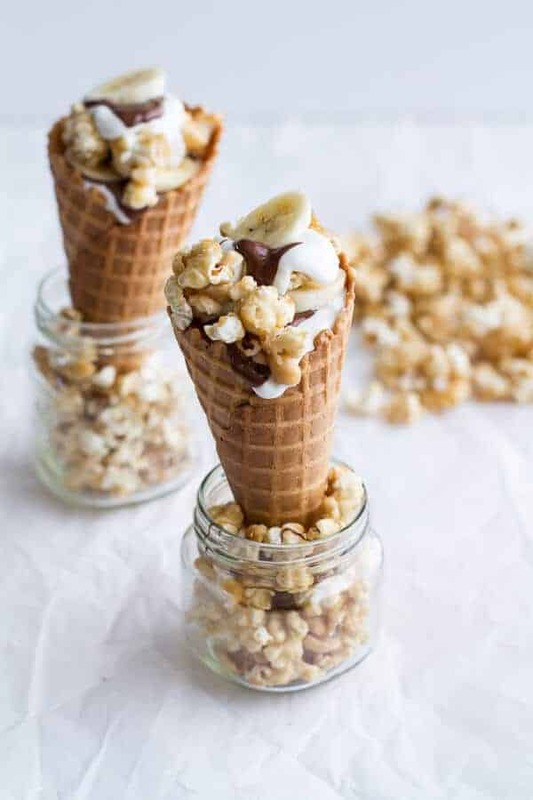 Love the idea of parfaits in a cone! I’ll take five, please. Totally wishing I had some waffle cones right now! wow that’s a fun looking treat! 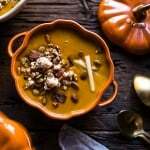 this is such a fun, whacky recipe T, I love it! So creative! Your mind works in wonderful ways! Love those cute little jars!! This looks like the perfect snack/dessert in the evening! Easy to put together and perfect for a night-in! LOVE! I’ve seen people fill a waffe cone with yogurt and berries and then freeze to resemble frozen yogurt, but I’m really a fan of rock hard yogurt! But THIS! Awesome! Almost like a portable parfait. 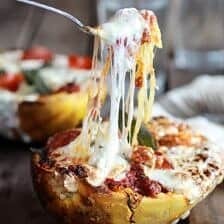 As I sit here counting down the minutes until an acceptable time to each lunch, you do not even know how excited I am to make this in about T minues 10 minutes. Or how about I just go an make it now… 😉 Thanks for an awesome recipe! Haha! Hope you loved it, Jen! Thanks for the sweet comment! 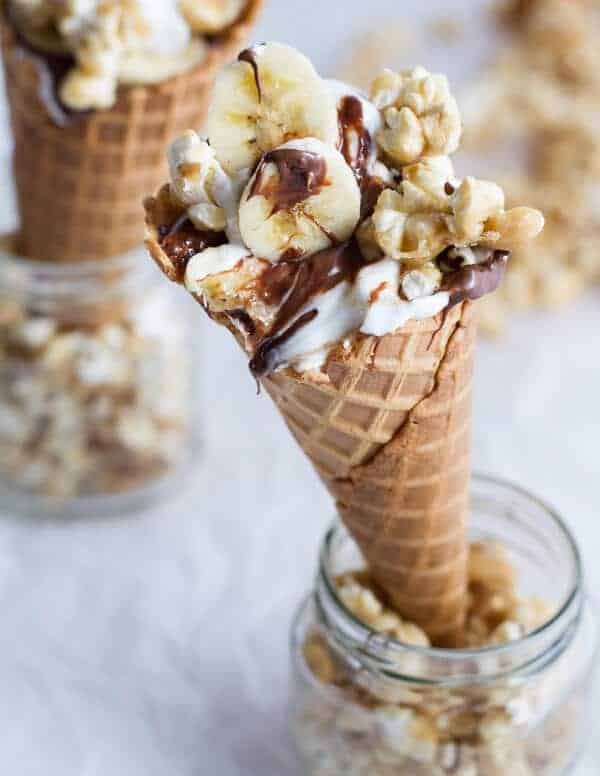 These waffle cone treats are wondrous! I mean, that popcorn? Cray cray awesome! This is a super creative idea for a healthy-ish yet indulgent snack. I like it! This is probably the best snack ever! I love that it’s also breakfast. I would probably more excited about healthy foods if they were always in waffle cones. Thanks Beth! Waffle cones are fun! I’m pretty sure you just gave me permission to have an ice cream cone for breakfast, and I am loving that!!! What a fun recipe that came out of nowhere! 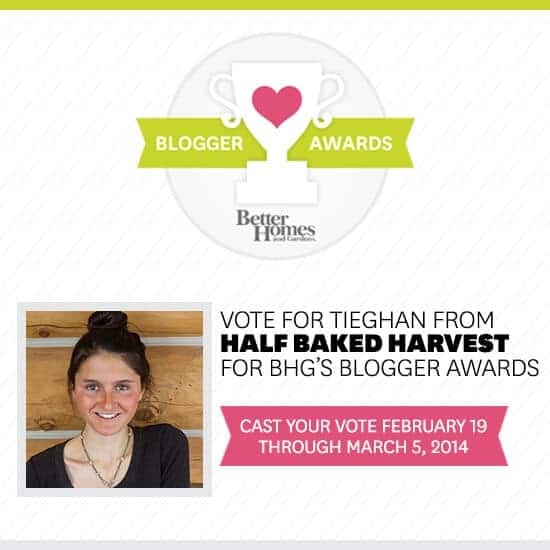 I’m going to vote for you right now – love your blog! Haha! I think I did too, LOL! Thank you so much, Beth!! Omg, so much is going on and ALL of it looks wonderful!! I think I just fell in love. yum! This is a great find! Wow on all fronts. Those jars are so cool, and how you used them to hole the cones, come on! So cute! 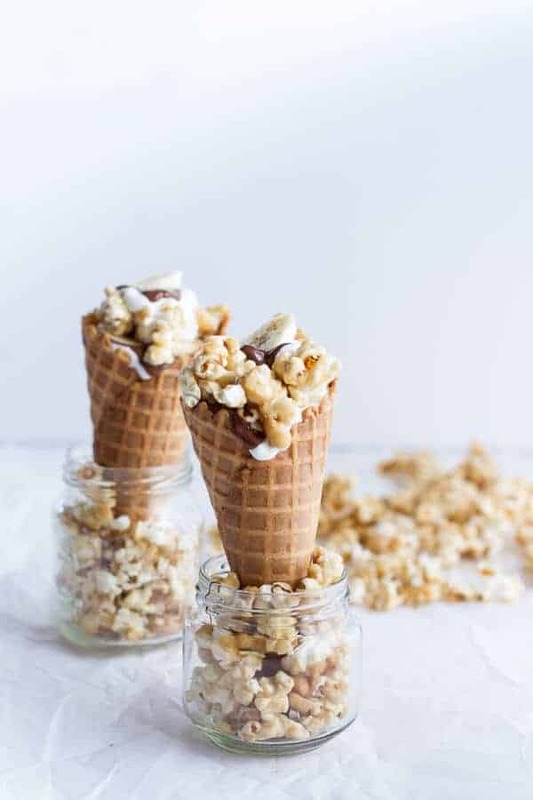 Such a fun snack idea, love the cashew caramel popcorn! Thank Laura! It really was a fun snack! Oh, I am drooling all over my keyboard! They look insanely delicious! Haha! Thank you so much, Sommer! 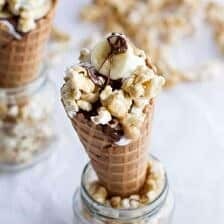 I have been searching for a cone stuffed with yogurt and popcorn recipe for *ages*, so glad I finally found a good one. I could have never made this on my own. Great idea adding bananas. How do you think of this?! You must be a genius. And it only takes 40 minutes to make? I tried a similar recipe that I found from Google that took over 2 hours. This one will be much better. Ha! I a so not a genius!! Trust me, this just happened out of being desperate to make something! LOL! Hi Tieghan, wondering where you purchased the waffles cones? have not seen them at the market. Thanks. Hey Cheri, I just get mine at target or the grocery store. Hope that helps! I want this for every meal… EVER! You’re so brilliant, girl! This is too much fun!! Need!! Love that you thought to serve a parfait in a waffle cone — how much more exciting is that! 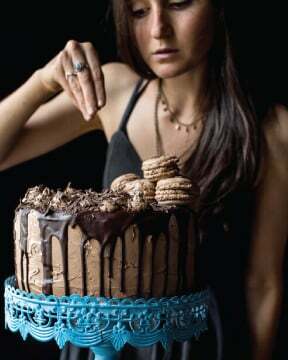 And with nutella slathered between every layer of yogurt? Heck yes! Oh wow, this recipe is so fun! I’d love to have my hands on this right now, so good! Omg! Thank you so much, Hayley! You are so sweet. You kind words make my friday night! What a fun idea! I really hope to see you win to because you totally deserve it! 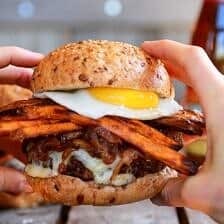 I love recipes that just come from wanting a snack and throwing something together!! 😉 This sounds fantastic! Pinned!! Wow. Your site is mindblowing–and dangerous! 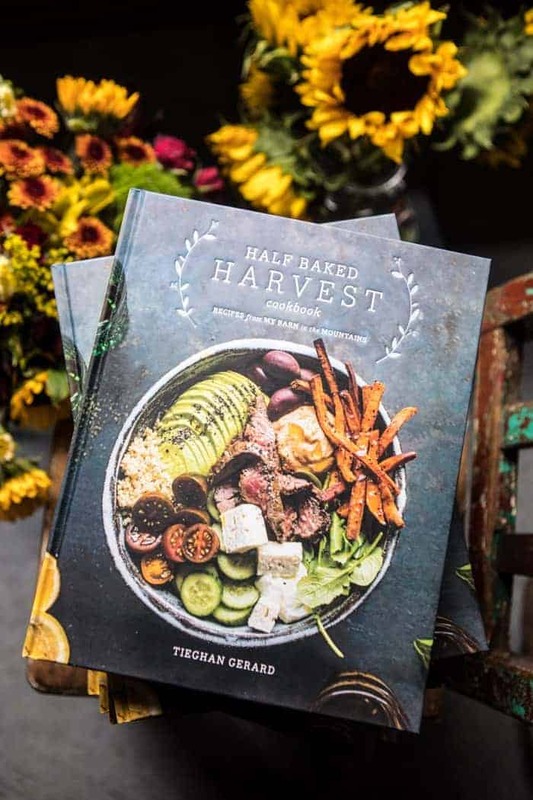 Thanks these recipes all look incredible! Aww! Thank you so much, Elle! Hello,Love those cute little jars!! This looks like the perfect snack/dessert in the evening! Easy to put together and perfect for a night-in!